The ABCJesusLovesMe Preschool Curriculum is a comprehensive, research-based preschool curriculum focusing on Bible, academics, and development. Each curriculum contains goals and objectives to gauge the child's learning and growth. Beyond the weekly lesson plans, ideas, and materials are provided to support parents and teachers along the way. To help adults be intentional with the children in their lives. We believe children are blessings from God. He has created each child unique and special. Learning should be incorporated into the child's day instead of controlling his/her day. We believe preschoolers should be able to explore, play, and learn new things through trial and error; not through "drill and kill." 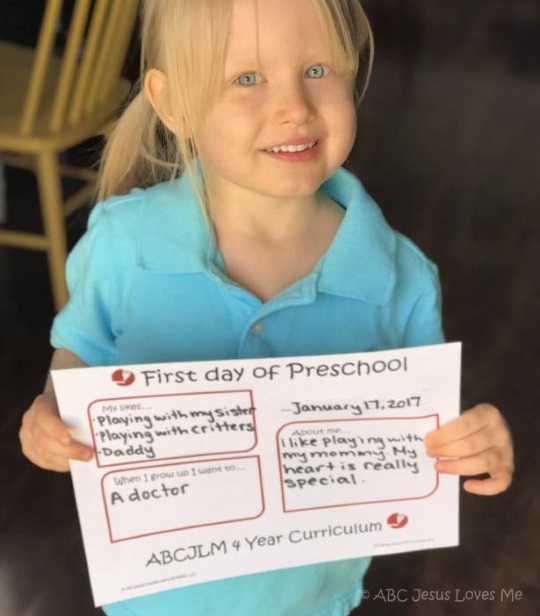 Our simple and basic curriculum allows success for the most energetic child but allows for supplemental material to be added for the child who desires more sit-down activities. Each curriculum and lesson plan includes a set of objectives along with a list of supplemental materials and suggested activities to help teach the objectives for the week. Several ideas are provided in the lesson plans as well as in the Supportive Ideas section to accommodate the various learning styles of each child. Objective Checklists are provided to choose the appropriate curriculum for the child and check for academic progress. Review weeks and worksheets are also provided to check for learning. Preschool Notebooks are available to combine all of the activities that the child has done throughout the curriculum, share with others, and track progress along the way. "Research shows clearly that children are more likely to succeed in learning when their families actively support them. Families who involve their children in activities that allow the children to talk, explore, experiment and wonder show that learning is both enjoyable and important." "High-quality programs empower young children by encouraging them to initiate their own learning activities. The idea that young children initiate their own learning activities rather than act as mere passive recipients of information from others is central to developmentally appropriate practice for young children. Such active learning encourages children to solve their everyday intellectual, social, and physical problems and to assume a measure of control over their environment." Schweinhart, Lawrence J. (1994, January). Lasting Benefits of Preschool Programs. "Fine motor skills activities for children are the best way to ensure proper development and practice of fine motor skills to promote the most functional use of a child's hands. ... Childhood is the critical time to properly develop these muscles... ."
"Play is your child's work. Through play children practice the basic skills needed in the classroom -- and in life. Guided play in the right environment will help your child gain the tools she needs to sharpen her thinking, and heighten her sensitivity." "When play, love, and work are all involved, learning and development are the most effective. Play is not a luxury but rather a crucial dynamic of healthy pysical, intellectual, and social-emotional development at all age levels." Healthier Children. Da Capo Press. "Reading books aloud to children stimulates their imagination and expands their understanding of the world. It helps them develop language and listening skills and prepares them to understand the written word." "Getting preschoolers to take over the brushing, scrubbing and rinsing themselves is an important step in the development of a preschooler's independence. Not only does it give parents a welcome break and help ditch the dirt in the short term, but teaching basic hygiene concepts to children at a young age will form the groundwork of a healthy lifestyle in the future." "Without doubt, reading with children spells success for early literacy." Simple Strategies for Creating Strong Readers -- Helping Your Child Become a Reader. US Dept of Education. "Movement is at the very center of young children’s lives. It is an important facet of all aspects of their development, whether in the motor, cognitive, or affective domains of human behavior. To deny children the opportunity to reap the many benefits of regular, vigorous physical activity is to deny them the opportunity to experience the joy of efficient movement, the health effects of movement, and a lifetime as confident, competent movers." Gallahue, D. (1993). Developmental physical education for today’s children. Dubuque, IA: Brown & Benchmark. "Early childhood education is rooted in the belief that learning through doing is fundamental for young children." Henninger, M.L. (2009) Teaching Young Children: An Introduction. Pearson. "Music encourages the ability to listen and concentrate. Songs encourage speech and auditory discrimination." *With exception to the Bible, listing a quote does not equate to an endorsement by JLM Media, LLC for other ideas promoted in the books and articles mentioned above.